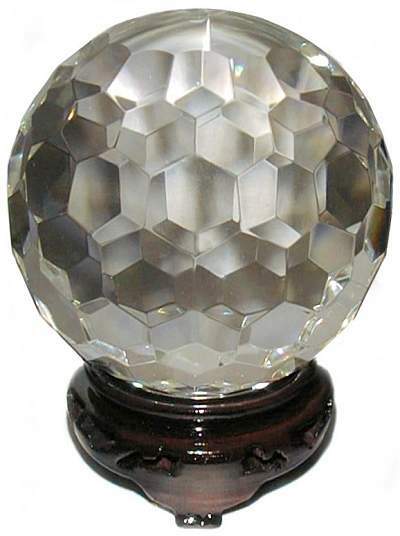 These beautiful Facet Quartz Crystal Balls have even more dazzling reflections than the regular crystal balls. They are decorative "jewels" made from flawless fused quartz crystal and facet cut with unusual soft curved edges and two round uncut domes. Get the ultimate Feng Shui cure for increasing Chi energy or zest for life into your home or office. The Large Oriental Wood Stand is sold separately. In Oriental philosophy the unlimited Chi energy is the universal source of life force which surrounds and flows through all living creatures. Quartz Crystal is reputed to aid and increase the flow of Chi energy from the unseen core of being into the day to day physical world. As this life force flows more freely, it nourishes and balances the mind, emotions and physical body and corrects color-ray imbalances within them. Since this stream of vital energy touches every facet of being, all aspects of life improve.